Zach Pochiro wasn’t very bashful as a 10-year-old. When he saw Blues defenseman Al MacInnis at a youth hockey tournament in Canada, he approached him without hesitation and politely asked for an autograph. MacInnis obliged and Zach still proudly displays the signed jersey at his home in Las Vegas. Nearly a decade later, Zach is a St. Louis Blues prospect and was working out several feet from where MacInnis was standing at the team’s annual Development Camp at St. Louis Outlet Mall. But did Zach approach the Hockey Hall of Famer? Imagine his surprise when the Blues selected him with a fourth round pick, No. 112 overall, at the 2013 NHL Draft on June 30. 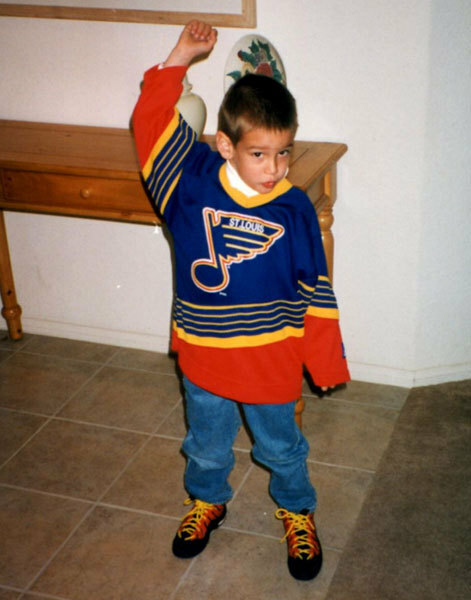 You see, being drafted by the Blues is extra special for the Pochiro family. 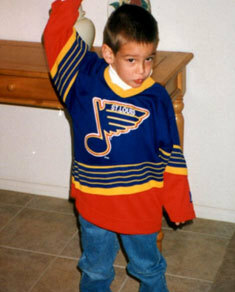 Without an NHL franchise to root for in the town he grew up in, Zach became a die-hard Blues fan. Notice how Zach says “we” when referring to the Blues organization? He’s been property of the Blues for less than three weeks, yet it’s almost as if he was born to be a Blue. Zach got his start in hockey while learning to skate during public sessions in Vegas. When he was four, he met NHLer Marty McSorely at a public skating session. McSorely convinced Steve to buy Zach a hockey stick. Ever since that moment, Zach hasn't been able to get hockey off his mind. He worked his way up, eventually lacing up the skates in 2011-12 with the Wichita Falls Wildcats of the North American Hockey League. Despite being draft-eligible in 2012, Zach went undrafted but kept chasing his dream, landing with the Prince George Cougars of the Western Hockey League. Last season, he posted 15 goals, 24 assists and 105 penalty minutes in 65 games. It was enough to get noticed. After the draft, Blues Director of Amateur Scouting Bill Armstrong mentioned determination, ruggedness and grit when describing Pochiro’s play. Obviously, the Blues agree. On draft day, GM Doug Armstrong traded a seventh round pick and a fourth round pick in 2014 to Nashville to get him. But Zach was only born in St. Louis. He knows he will have to work his tail off to get back. Getting drafted was a good start. Now, if only he could find the courage to approach MacInnis.